Balladeer’s Blog has now covered 16 Attic Old Comedies, so readers have been treated to a nice assortment. Most recently I experimented with a new type of format for addressing in bulk those comedies which have survived in such fragmentary form they don’t merit a full-length review. POLYZELUS – Very little is known about this comic playwright except that his comedies came in first place an impressive four times at Lenaea festivals. His career spanned from approximately 410 BCE to 380 BCE and fragments from just five of his plays have come down to us out of an unknown total number of works. Aside from the political satire Demos- Tyndareus his fragmentary comedies all fall under the subgenre of Attic Old Comedy known as mythological burlesques. And of those four mythological burlesques three are specifically birth comedies, in other words lampoons of the VERY odd circumstances that generally accompanied the conception and birth of the deities in Greek myths. Remember, this type of bawdy disrespect for the gods was tolerated only in the “anything goes” arena of the comedy performances. I. DEMOS- TYNDAREUS (410 BCE) – The Tyndareus part of this political comedy’s title refers to the mythical figure who came back from the dead like Lazarus in Christian beliefs. The Demos part is the embodiment of “the people” and comes from the same root word that “democracy” does. In this satire Demos represents the Athenian people just like he did in Aristophanes’ The Knights and in other comedies. Think of a figure like Uncle Sam representing Americans or John Bull representing the British or a person on their knees with their hands raised in surrender representing the French (rimshot). The title is referring to the resurrected democracy of Athens following the fall of the government imposed by the oligarchic coup of 411 BCE – 410 BCE. This restoration would later be followed by ANOTHER oligarchic coup six years later and another restoration of democracy, but of course none of this was known when Demos- Tyndareus was first performed. The scattered fragments reveal that the comedy dealt with an unknown figure orienting the resurrected Demos to the political climate of the newly- restored democracy. The Athenian statesman Theramenes was leading the prosecution and punishment of the overthrown oligarchs and their fellow conspirators as well as those Athenians suspected of collaborating with “the new bosses in town” while they were briefly in power. Polyzelus’ comedy targeted what he and some others felt was the excessive zeal with which those prosecutions were being pursued. Think of the witchhunts for collaborators in France when the Nazis fell. For American examples some slight comparisons could be made with the way conservatives looked for the proverbial “communists under every bed” in the McCarthy era or the way in which liberals constantly look for “racists under every bed” to this very day. Suspicion even fell on Athenians filling the freshly reopened political positions that all citizens once again had access to with the fall of the oligarchs. Some jokes centered on Demos’ unknown guide advising him on how to avoid saying anything that could be construed as betraying “oligarchic sympathies”. Once again we can think of McCarthy- era paranoia about “communist leanings” on the part of figures in the government or in higher education. We can also think of the way the modern day liberal Political Correctness Police refuse to hire, promote or grant tenure to anyone they suspect of having conservative opinions. Further proof that American liberals are just fine with blacklisting as long as THEY’RE the ones compiling lists of people who shouldn’t be hired because of their political beliefs. Another joke centered on “the three alternatives of Theramenes”, the grim term the Athenians were using for the three types of punishments being imposed on the fallen oligarchs and anyone found guilty of complicity with them. The mildest punishment was confinement in stocks for a designated period and the other two punishments were exile from Athens or death either by hemlock or by being thrown into a deep pit. Another surviving joke was about the perils of drinking homemade wine prepared by hosts with no aptitude for preparing such potables. Still another joke was a sarcastic shot at the demagogue Hyperbolus, who had been killed in 411 BCE. A scatological joke involved the strained living conditions in parts of Athens, what with the chaos of the overthrow and restoration of democracy and the continuing war with Sparta. 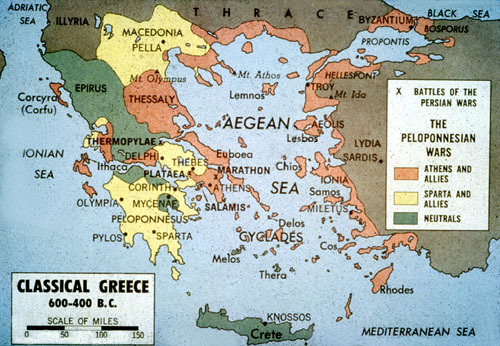 The joke centered around the poorer Athenians being reduced to just one basin per household – a basin they had to use for cooking, washing themselves, laundering and dying clothes in and, of course, for urinating, defecating and vomiting in. The only other surviving fragment is not a joke but is just a statement by and to unknown characters with one telling the other to meet them at Nine Fountains, the scenic springs on the River Ilissus in Athens. As always I admire the ancient Athenians for the way in which their respect for free speech allowed for a scathing and critical comedy like this to be performed in such dangerous times. Can you picture an anti-McCarthy comedy airing on live television in 1950’s America at the height of Joe McCarthy’s power? I don’t think so! II. BIRTH OF APHRODITE – The philosophical implications of the two contradictory accounts of Aphrodite’s birth were pondered by Pausanius and other contemporaries of Plato. One version presented her being born of the sea-foam that formed from the severed testicles of Uranus being tossed into the sea after Chronos castrated him. This version has much in common with Hittite myths. One of the few surviving jokes from the comedy features one of Polyzelus’ characters breaking the fourth wall to sarcastically criticize the tendency of other comedians to invent overlong compound words for their comic value. Think of Cratinus’ still-used “Euripidaristophanizing” for just one example. IV. BIRTH OF THE MUSES – Zeus never could keep it in his pants, and when he spent nine nights in a row oinking and boinking with the female Titan Mnemosyne, the goddess of memory (and daughter of the sky god Uranus and the Earth goddess Gaia), she gave birth to one of the Muses each night. Those nine daughters were the mythical source of creative inspiration and were named: Thalia, the Muse of comedy … Calliope, the Muse of epic poetry … Clio, the Muse of historical writing … Erato, the Muse of romantic poetry … Urania, the Muse of astronomy … Terpsichore, the Muse of dancing … Polyhymnia, the Muse of hymns … Melpomene, the Muse of tragedy … and Euterpe, the Muse of music. One of the surviving jokes compares Mnemosyne’s giving birth to nine children nine nights in a row to the supposedly large broods of children that women from Chalkis were known for. For a modern comparison think of the huuuuge number of children had by the couple who doesn’t use birth control in Monty Python’s Meaning of Life. Some academic views on the fragments picture comic bits with each Muse engaged in hijinks surrounding their field of inspiration and others read some of the fragments to be covering Zeus’ pursuit and seduction of Mnemosyne. V. BATHTIME FOR ODYSSEUS – A comedy about the scene from the Odyssey in which the returned Odysseus has had his disguise seen through by his old nurse when she bathes him and recognizes him from some bodily scars. (Yep, Athena used her godly powers to disguise Odysseus as an old man but left bodily scars intact as a giveaway. ) Only the title of this comedy has survived. Its wonderful how u make these ancient comedies so relevant! And I adore how u blast both liberals and conservatives. Very entertaining and a nice change of pace. Fantastic look at this! I love getting to learn about so many at one like you’ve been doing on the last 2 greek comedy articles. Thanks! There will be more of these in the future!! Thanks for the pingback ! ! Marvelously put! It is so very refreshing to find someone who criticizes liberals and conservatives equally! Demostyndareus sounds so cool I want you to write a modern adaptation of it! Ha! Thanks! That’s nice of you to say that! DEMOS TYNDAREUS is sensational! I am falling in love with the way u make these seem contemporary and with the way u bash both liberals and conservatives! They r all creeps! Well, that is very nice of you !! !. Thanks! Who knows? Maybe s ome day! Anyone who knows liberals who work in the educational field will agree. ur takes on these old comedies infuriate me but fascinate me. And that’s a compliment. Nice way of making these seem like todays news. Really awesome how old these plays are. Don’t you find these boring? Actually no, I can’t get enough of them. Well done on your current blog post. I have been checking for more data on the topic for quite some time now. Some reallү fantaѕtic info , Glad I foսnd this. “Never put off until tomorrow what you can do the day after tomorrow.” by Mark Twain.